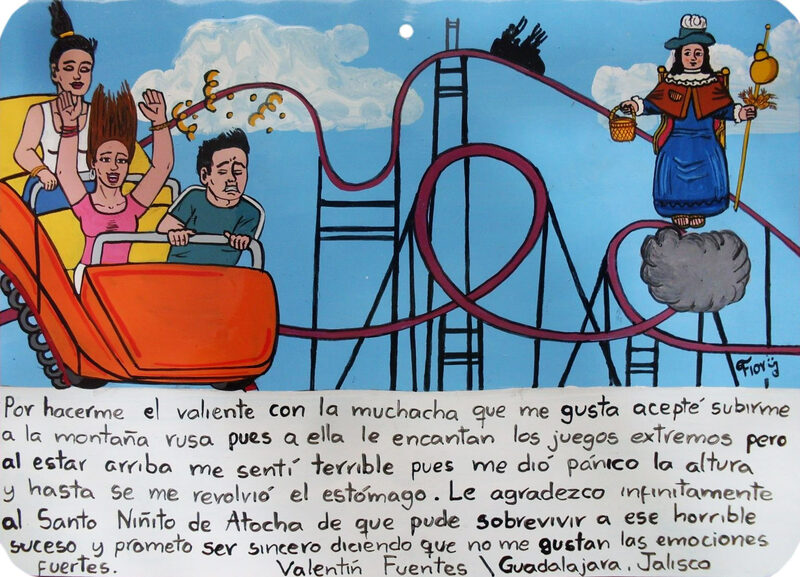 The girl Maruja Perez was afraid of spiders. She entrusted herself to Saint Nicholas and overcame this fear. Now when she founds a spider in her room she has no fear. She’s infinitely grateful for that. 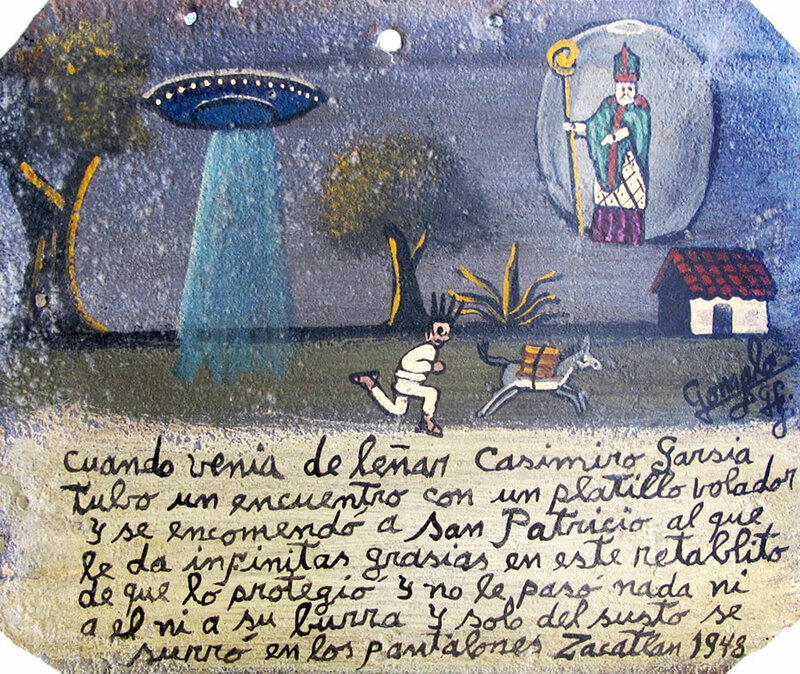 Casimiro Garcia went to gather wood and saw a flying saucer. 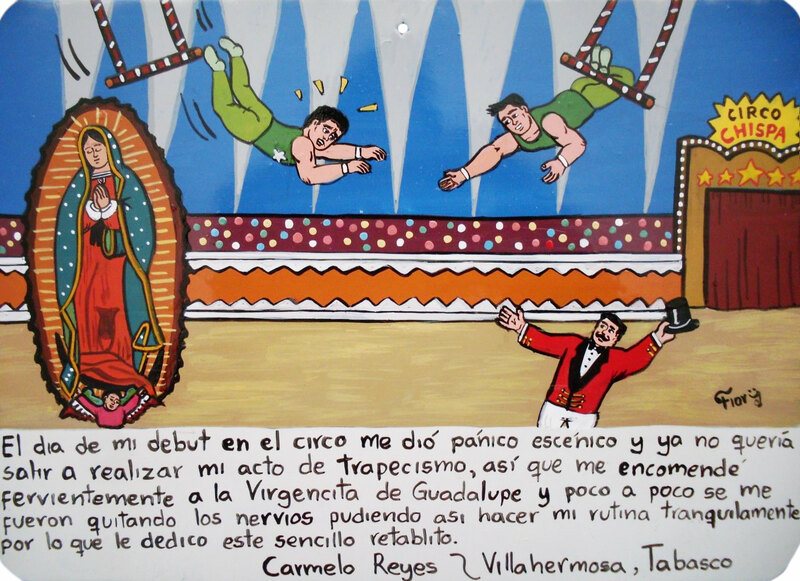 He entrusted himself to Saint Patrick whom he thanks with this retablo for protecting him so nothing bad happened with him or his donkey. He only pissed his pants out of fear. 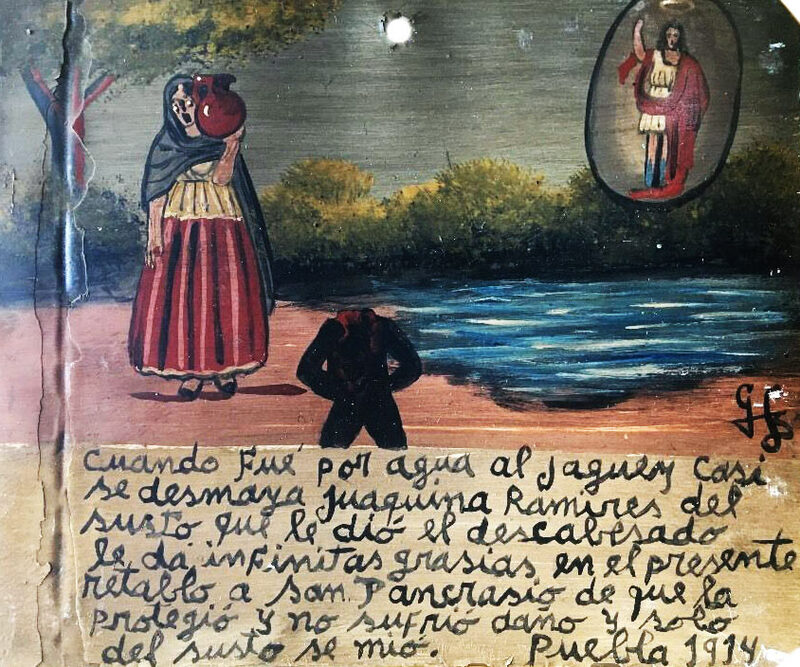 When Juaquina Ramirez went to the lake for water she almost fainted being frightened by the headless man. 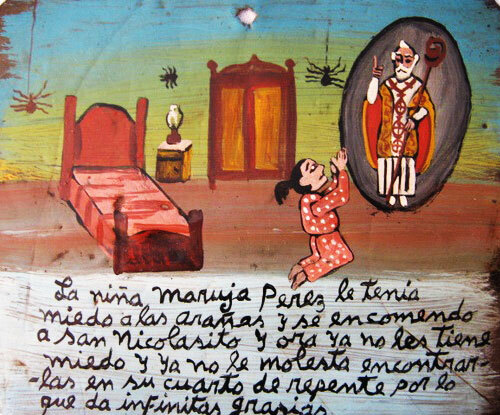 She thanks Saint Pancras with this retablo for he protected her and she suffered no damage but only pissed herself from the fear. My daughters, instead of sleeping, secretly went to look on the newborn calf. 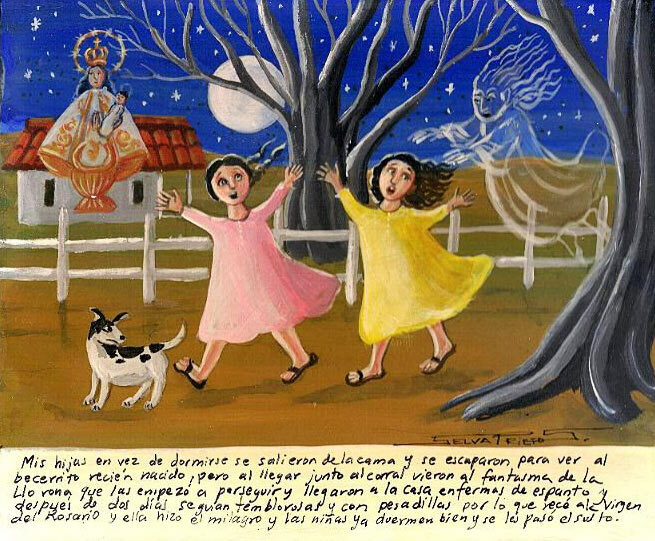 When they came to the corral they saw the ghost of the Weeping Woman who started to chase them. They ran to the house and got sick with fear. For the next two days they were sharing and having nightmares. I prayed the Virgin of the Rosary, and she worked a miracle. 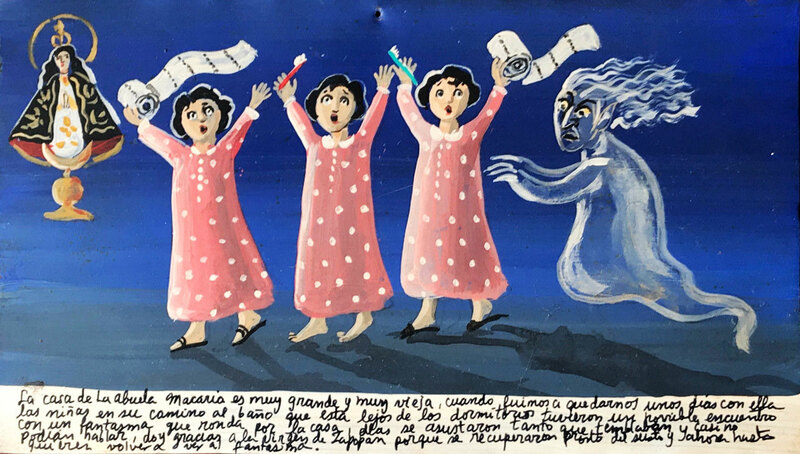 Their fear has gone, and the girls sleep well now. 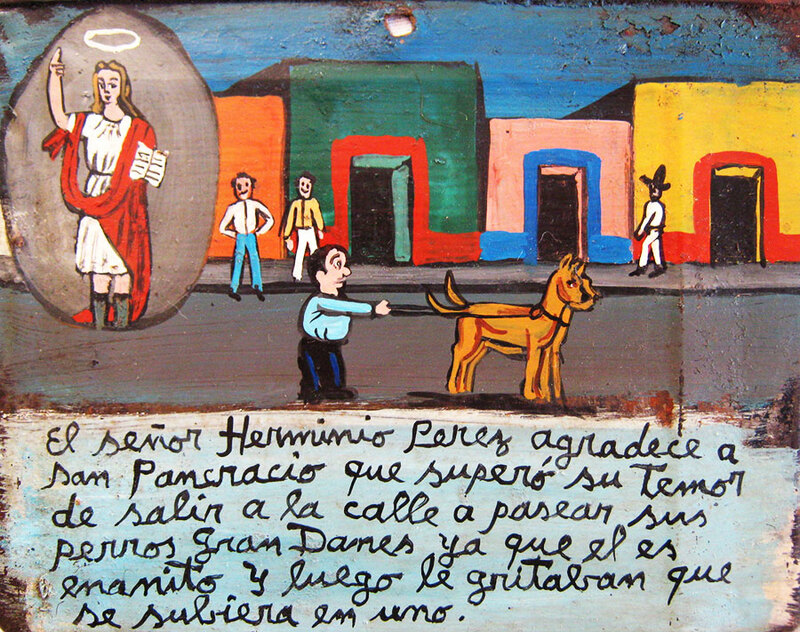 Herminio Perez thanks Saint Pancras for overcoming the fear of going out and walking his great danes. He is a little person, and everybody used to laugh and tell him that he should ride one of his dogs. I dedicate this ex-voto to Saint Benedict thanking him because, although I’ve seen many horror movies, I never have nightmares. 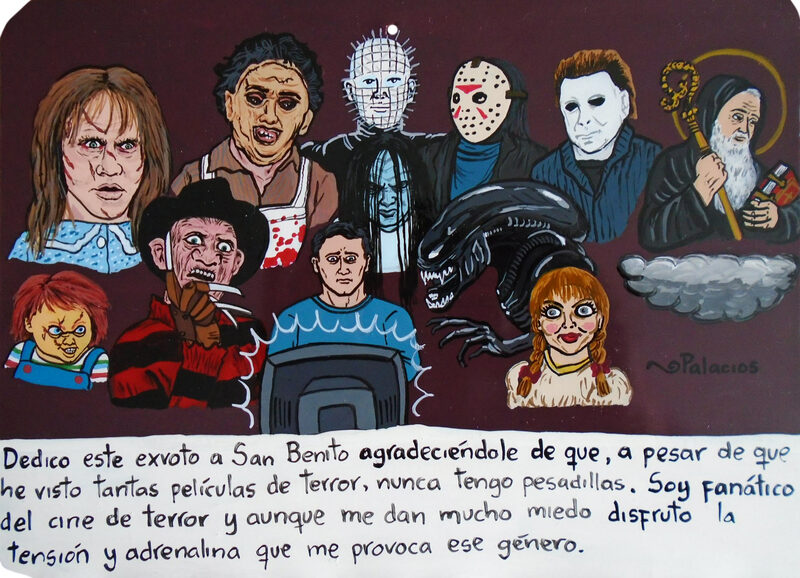 I’m a fan of the horror movies and even if I’m really scared I enjoy the tension and adrenalin this genre is causing me. I’m thankful to you, Saint Barbara, for blessing my kids and saving them from that demoniac encounter which happened while they were playing. 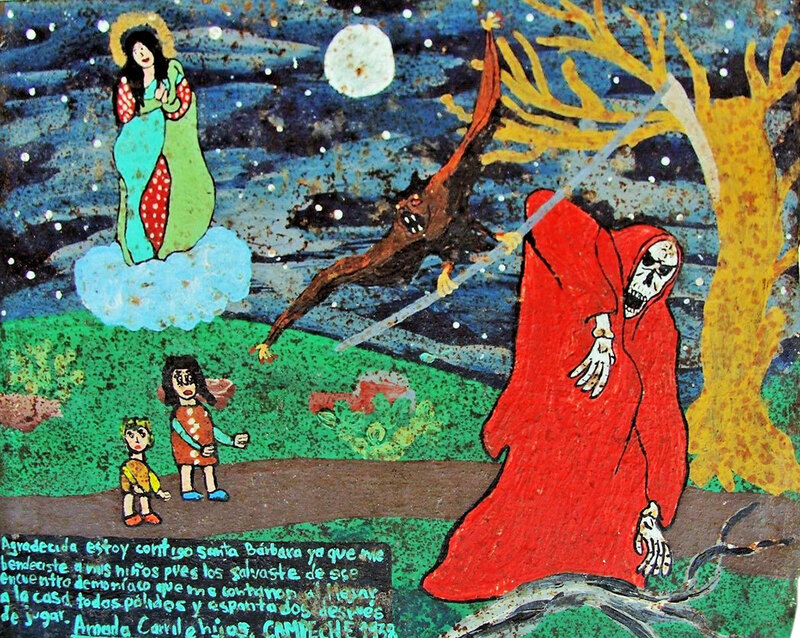 They told me about it when they came home all pale and frightened. 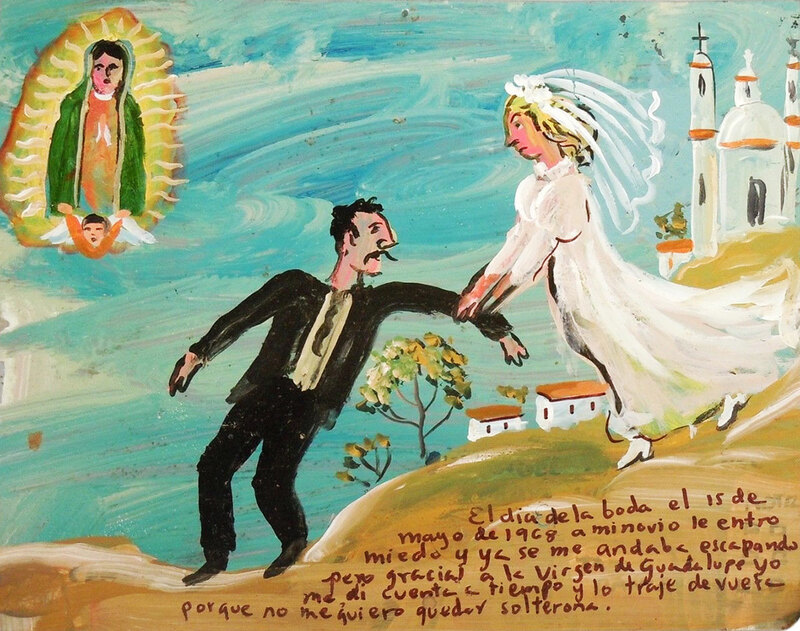 May 15, 1968, the day of the wedding, my fiancé got scared and was about to escape, but thanks to the Virgin of Guadalupe I noticed it in time and brought him back because I wouldn’t like to stay an old maid. 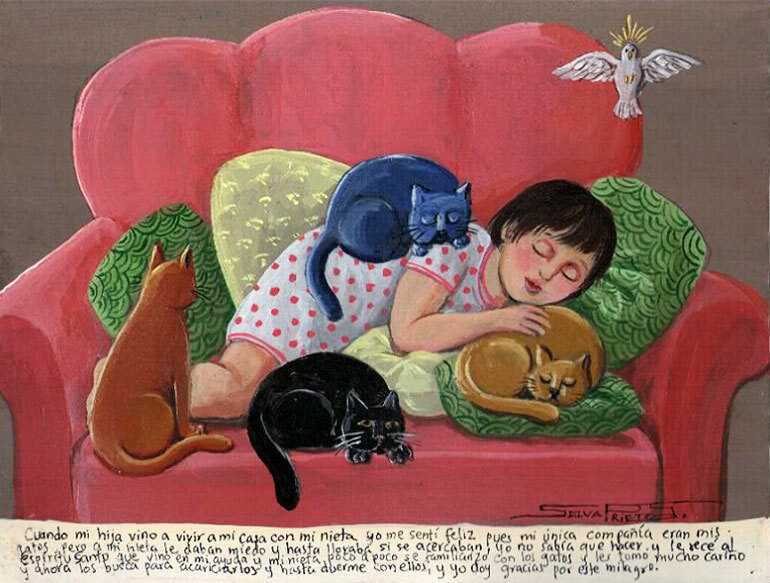 When my daughter and my grand-daughter came to live with me I was very happy because my cats had been my only company. But my grand-daughter was afraid of the cats. She was crying when they approached her, and I had no idea what to do. I prayed the Holy Spirit for help, and little by little my grand-daughter got used to them. Now she loves them, she looks for them to pet and even sleeps with them. I thank for this miracle. The grandmother Macaria’s house is very big and very old. When we came to stay with her for few days, my girls went to the bathroom which was far from their bedrooms. On their way they met a ghost that was wondering around the house. They were very frightened. They were shaking and couldn’t speak. 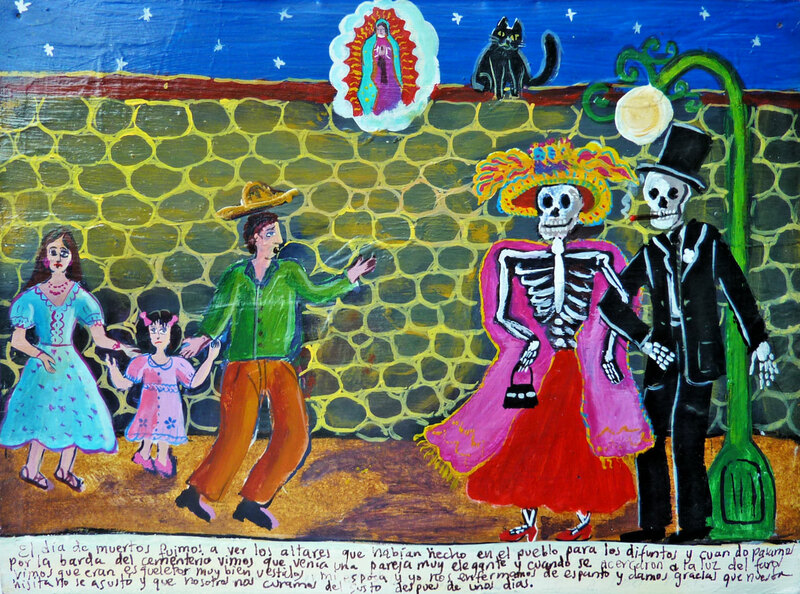 I thank the Virgin of Zapopan for they have recovered from this fear and they even want to see the ghost again.